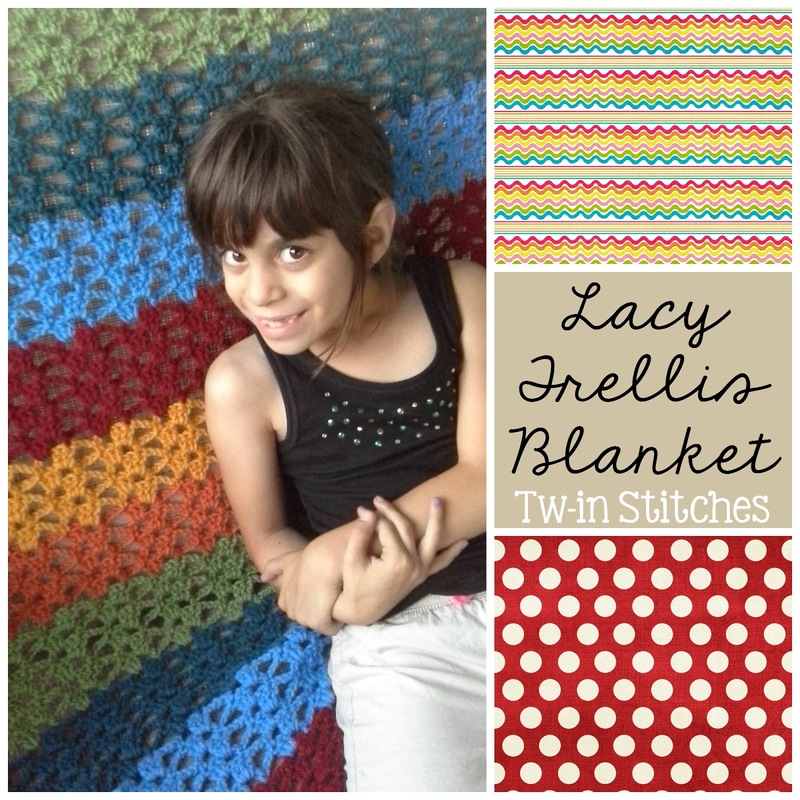 The Lacy Trellis Blanket was obvious after so many ponchos. The beauty of this blanket is that it uses less yarn than a granny stripe. I finished this blanket (a twin size blanket) with 6 skeins of Red Heart Super Saver. That includes the scallop border I designed on the vertical edges! 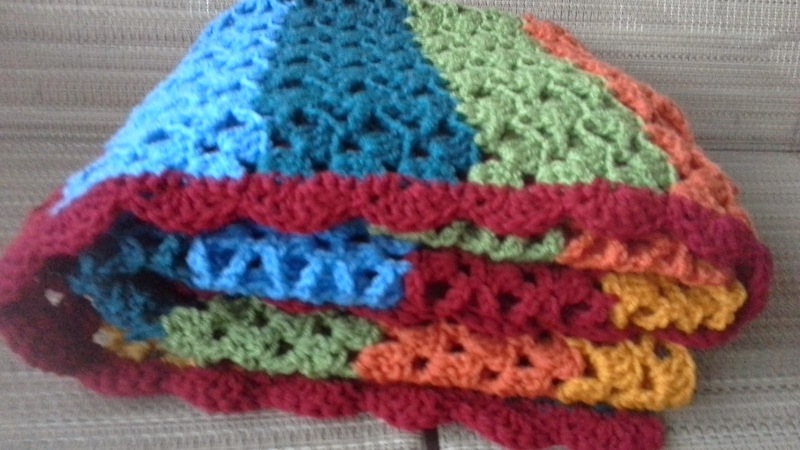 Because this blanket is so open, I used the Double Knot method when I changed colors. It was miraculous! With a little trial and error, I managed to get the join to completely hide my join knots. **Notice I'm not including a tapestry needle. No need with the Double Knot method! Chain: a multiple of 8 plus 5 more chains. I started mine with 181 chains. Row 3: DC 3 times in the first chain 2 space from the previous row. *Chain 3, SC in the top of the first DC in the next cluster. Chain 2, 3 DC in the next chain 2 space. * Repeat from * to * across. Chain 3. Turn. Continue repeating Row 3 until your piece measures your desired height. Final row: To make the end of the blanket match the beginning, we are going to do a row of solid stitches. In the last row, you finished with a 3 DC cluster. Chain 1, SC in each of the DCs in the cluster. 1 HDC in the chain 2 space. 1 HDC in the top of the SC. 2 HDC in the chain 3 space. Continue across with 1 SC in each of the 3 DCs, 1 HDC in the chain 2 space, 1 HDC in the SC, 2 HDC in the chain 3 space across. If you find that this row is starting to ripple, you may need to only crochet 1 HDC in the chain 3 space. It really depends on your tension. Finish with your preference of border! 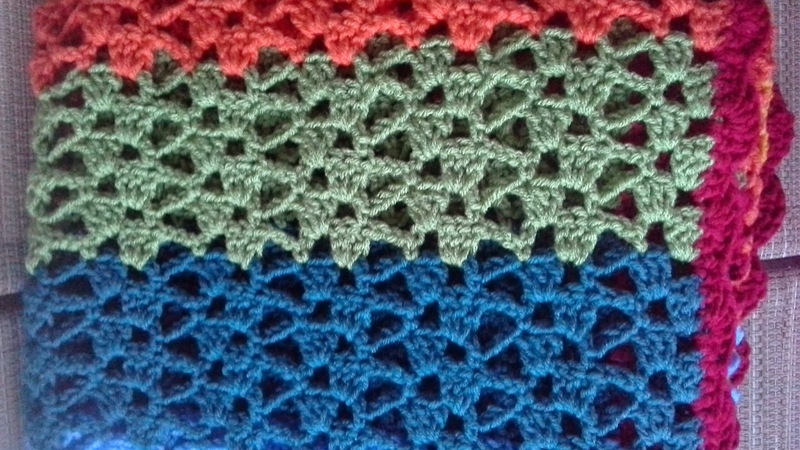 My scallop border on the sides can be found in the comments below. Upside down, but this shows the scallop border I added to the vertical sides. No border was used on the horizontal sides. Thank you, Wanetta! It is my favorite blanket pattern! Getting ready! You have chain 3, turn, at the end of row 2 and chain 3 at the beginning of row 3... Is it just one or the other?? Hi, Jess, Thanks for pointing out the extra chain 3. I've updated the pattern. I appreciate the help! I am loving this pattern! I'm halfway through the blanket and wonder if you have the border pattern somewhere? Hi, Jodi! I'm so glad you are enjoying it! For the blanket in the picture, I decided to go simple. After the final row, I did a row of single crochet in the same color as the last block so that the last row and the beginning row would match. The only real borders (in red) were done on the sides. 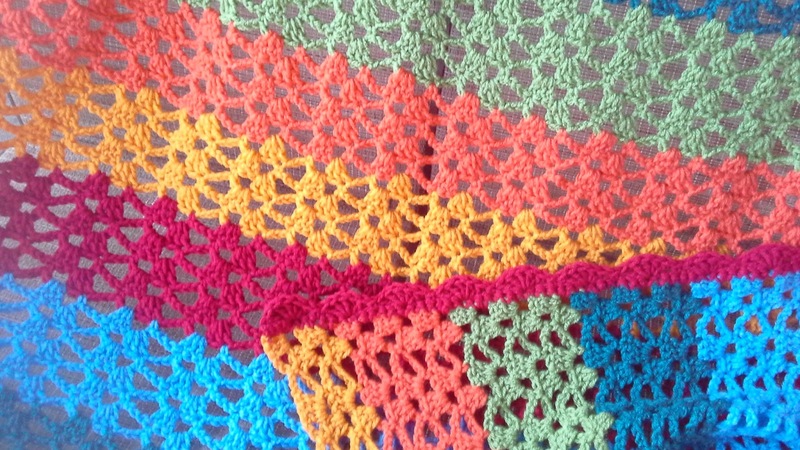 It is a simple 2 row border. Row 1: I joined the border color in the first stitch of the side, chain 1 and SC along, making sure to crochet 2 single crochets in each "row" (so 2 single crochets in each dc and in each chain 3 space). At the end, I did a chain 1 and turned the work. Row 1: *Skip 2 stitches. In the third stitch, DC five times. Skip two stitches. Slip stitch into the next stitch. * Repeat pattern across. Repeat on the other side. It gives you a really nice look with the borders just on the sides. I liked it a lot! Thank you! I can't wait to make some of your other patterns! 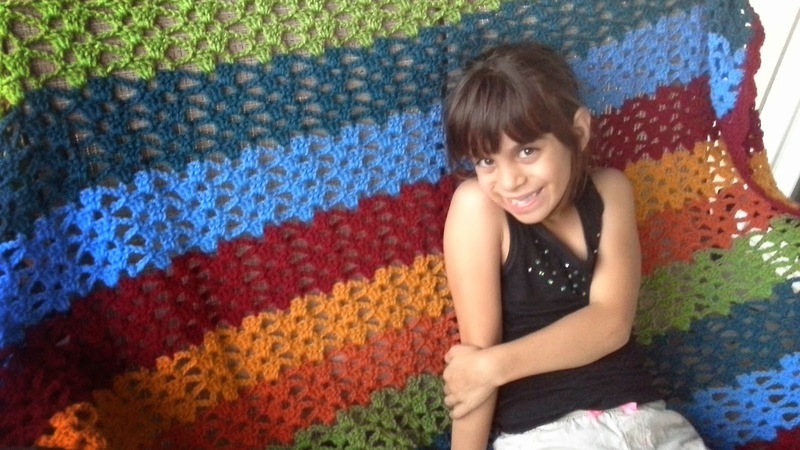 I just completed a blanket in this pattern with Red Heart Ombre. It turned out so pretty! this picture makes it look more brown than gray. Great Pattern. Thank you!